The Yellowstone River offers some of the country's great trout fishing. The Yellowstone River itself, both in and out of the Park, provides the principal hub around which are arrayed the other great waters of the region. 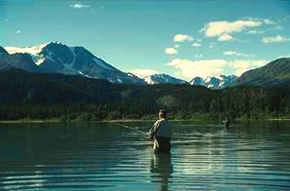 Wilderness fishing in the high lakes and streams abound, as Yellowstone National Park and the surrounding National Forests comprise a single block of nearly 4 million acres of wilderness or back-country management. Price includes professional guide, permits, and rental of fly and rod. Cost: $235 per person for half day.